Filttr Blog • O look, ßeta3 is here! O look, ßeta3 is here! It’s been a long wait, hasn’t it? Well, we promised you that it’ll be worth the wait this time around, and we’re not going to disappoint. Filttr ßeta3 comes to you with a slew of new features, and improvements to the old one, that’ll bring all the fun back into Twittering. There are lots of features, so try and keep up! Yes! Filttr is bringing back IM to the Twitter world. We’ve added enough features so that you won’t have to ever open a browser or an app to interact with Twitter. Send and get updates, including replies and direct messages, user information, and … wait for it … search! 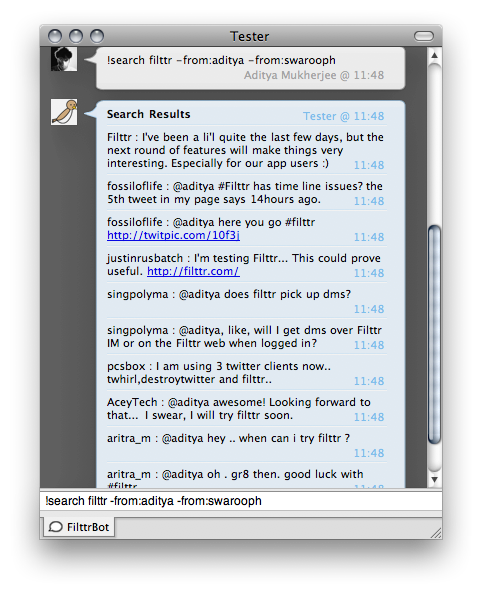 You can search Twitter directly from within your messaging window. Just give it a query like you would normally give to Twitter Search, and voila! Begin by enabling IM for your account at our Settings page by first entering your Twitter password (which we need to get your timelines from Twitter) and then the GTalk/Jabber address, where you want these tweets. Filttr Bot will add you as a friend and send you an activation link to confirm that you are the owner of that address, which if you click should take you back to the Settings page and tell you that everything has been verified. If it doesn’t, something went wrong. Try enabling again, and if you have trouble after that, let us know – we’ll have a look. If everything goes dandy, the bot will tell you that IM has been activated and give you the list of commands you can use. It will send you your tweets, replies from your friends and direct messages at regular intervals of one to two minutes. You can use the commands to get any of those out of turn, if you want. We also have an easter egg hidden here, so if you find it, do let us know. We have something special in mind for the first one to guess what it is. Uni-timeline, conversations and groups, oh my! We gave you a killer web interface in ßeta2, but weren’t happy with just that. At Filttr, we’re all about focusing on what is important, and we want to give you the best of every interface that we provide. Hence, we went back (again!) to the drawing board, and decided to come up with something that would help you focus more. The result was Groups! Now you can form groups of users, and just get updates from those users without having to deal with others. This is perfect for times when there are big events going on (like WWDC), and there are some people live twittering the event. Just put them all in a group, and keep that group open in a tab. Presto! Of course, the use cases go way beyond something so simple, so we urge you to find creative ways of using these groups to further enrich your Twitter experience. 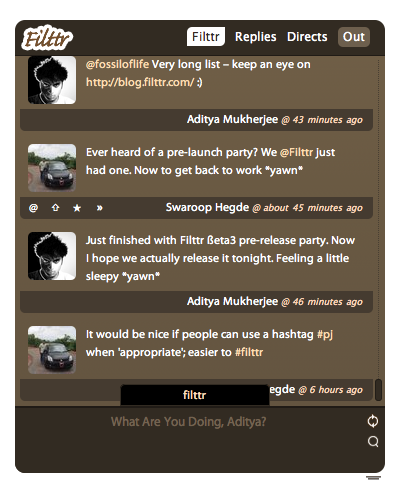 And, further improving our existing self-refreshingly awesome interface, we now have conversation tracking as well. Whenever someone replies to another person, you will see both the tweets – the reply, as well as the tweet that was replied to. It helps to not lose yourself in the middle of a conversation and wonder what you said, or what is being replied to. It’s so helpful, you’ll wonder how you got around without it. Along with that, we now have direct messages in the timeline as well, so that you don’t need to have an app open. Just keep the Filttr web timeline open, and direct messages will show up as and when you receive them, along with your normal tweets. Of course, replies and direct messages are now highlighted differently so that you can make out what is what with a simple glance. Replies are yellow, and direct messages are green. Not impressed with either of the above two (shame on you!)? 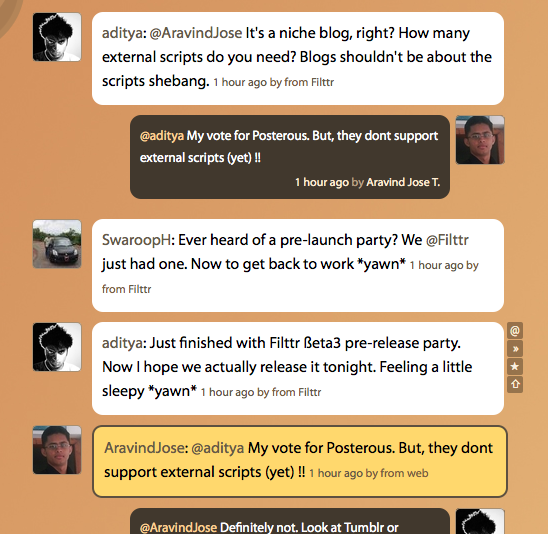 How about using the smallest full fledged Twitter desktop app ever? We have notifications – visual and audible, intra-timeline search – that searches through the currently shown timeline, resizing – so that you can see more or less, whatever you’re up to, and keyboard shortcuts! At just under 175 KiB, our desktop application is really fast and has a very small memory footprint. It supports multiple accounts, favouriting and retweeting. We’ve worked hard to make it an absolute delight to use, even though it is in beta. We hope you like it. Phew! This brings us to the end of the rapid fire feature additions we have been doing since Filttr went out in beta. For a more technical view of feature additions, feel free to roam about our bug/features tracker. We will now be concentrating on stability of these features, as well as final preparations to go into public beta. While we can’t put a date on it, we hope it happens sometime soon. Response to Filttr remains gratifying, and we hope you have as much fun using all the features as we had building them for you. Hope the new year is treating you well. Until next time! beta 3 is frikkin’ awesome. IM integration – something which we “oldies: were so used it back – thats the killer! Great job filttr team!